Who doesn’t love TACOS? 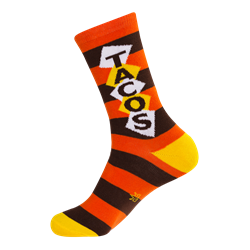 Show your love for these amazing flavor pockets by slipping your foot into a pair of our zesty TACOS crew socks. One Size Fits Most. 75% Cotton, 17% Polyester, 5% Spandex, 3% Rubber. Made in USA. Fit from a women’s size 6 US to approximately a men’s 12.5 US. Knit in a thinner weave, these socks hit around mid-calf and wear comfortably with all shoe types. Machine wash cold, line dry.